Larry McMillan's name is virtually synonymous with options. This "Trader's Hall of Fame" recipient first shared his personal options strategies and techniques in the original McMillan on Options. Now, in a revised and Second Edition, this indispensable guide to the world of options addresses a myriad of new techniques and methods needed for profiting consistently in today's fast-paced investment arena. This thoroughly new Second Edition features updates in almost every chapter as well as enhanced coverage of many new and increasingly popular products. It also offers McMillan's personal philosophy on options, and reveals many of his previously unpublished personal insights. 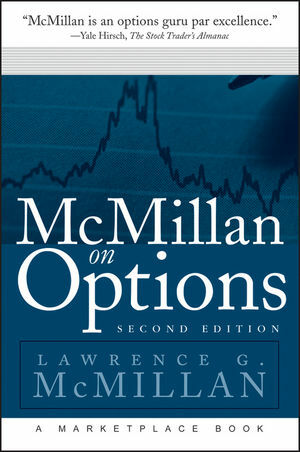 Readers will soon discover why Yale Hirsch of the Stock Trader's Almanac says, "McMillan is an options guru par excellence." LAWRENCE G. McMILLAN is President of McMillan Analysis Corporation. He authors "Daily Volume Alerts," a unique daily fax service that selects short-term stock trades by looking for unusual increases in equity option volume. He also edits and publishes The Option Strategist, a derivative products newsletter covering equity, index, and futures options. McMillan has spoken on options strategies at many seminars and colloquiums in the United States, Canada, and Europe. He was formerly senior vice president in charge of the Equity Arbitrage Department at Thomson McKinnon Securities, Inc. McMillan is the author of the bestselling Options as a Strategic Investment and the classic book, Profit with Options. 1 Option History, Definitions, and Terms. The Cost of an Option. The History of Listed Options. Influences on an Option’s Price. 2 An Overview of Option Strategies. Using Long Options to Protect Stock. Buying Both a Put and a Call. Options as a Direct Substitute for the Underlying. Options as a Proxy for the Underlying. The Effect of Stock Index Futures on the Stock Market. The Effect of Index Futures and Index Option Expiration on the Stock Market. Options as an Insurance Policy. Using Volatility Futures as Portfolio Insurance. 4 The Predictive Power of Options. Using Stock Option Volume as an Indicator. Using Option Prices as an Indicator. Implied Volatility Can Predict a Change of Trend. 5 Trading Systems and Strategies. Incorporating Futures Fair Value into Your Trading. The TICKI Day -Trading System. 6 Trading Volatility and Other Theoretical Approaches. Comparing Historical and Implied Volatility. Using Probability and Statistics in Volatility Trading. Appendix A: Listed Index and Sector Options. Appendix B: Futures Options Terms and Expirations.